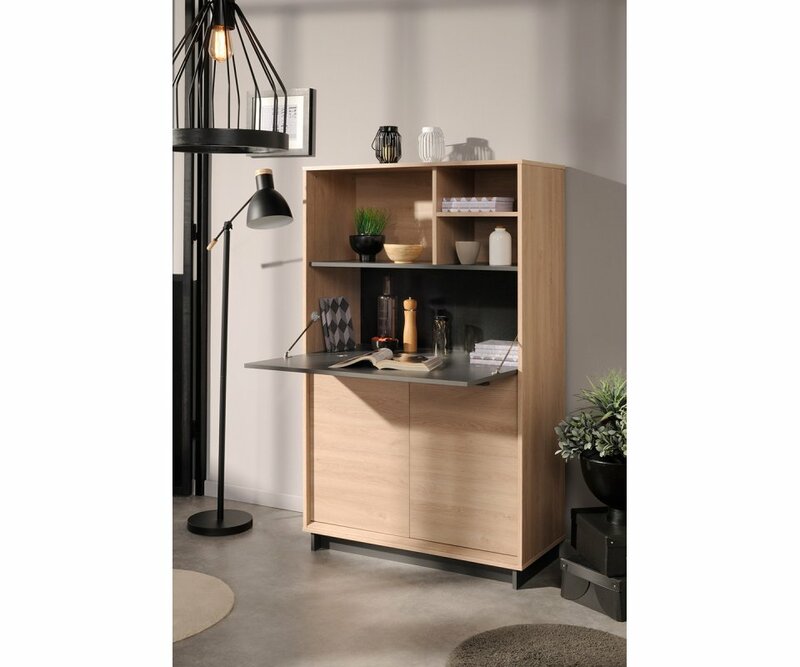 CONTEMPORARY DESIGN: Create a cupboard for your dishes or even a home bar with the versatile, contemporary design of this cabinet. TWO-TONE COLOR: With the appeal of wood and stone, this cabinet combines Brooklyn Oak veneer with solid Dark Gray veneer, creating dramatic contrast and natural elegance. 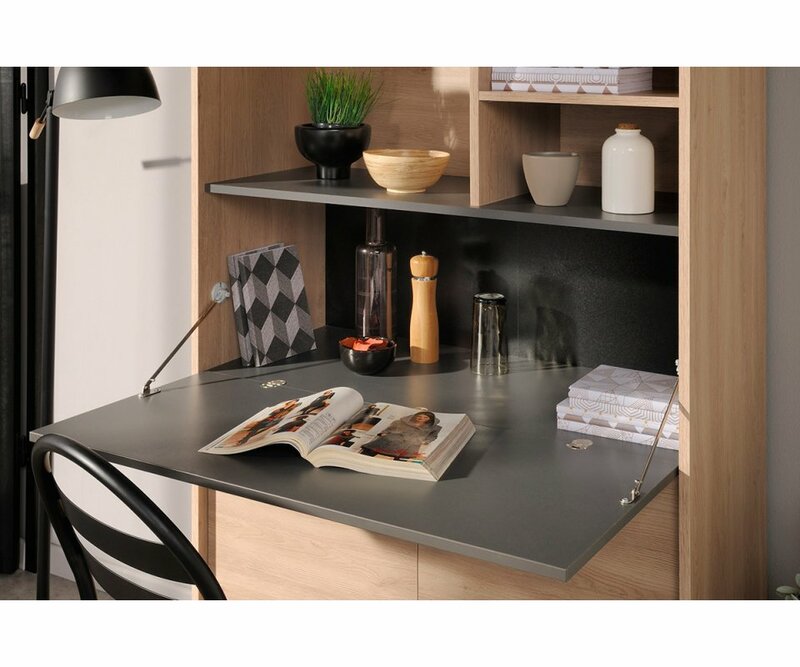 FOLD-DOWN COUNTER: The Dark Gray center panel folds down on chains to become a counter for serving, or a desk for using a laptop or creating your favorite dishes! 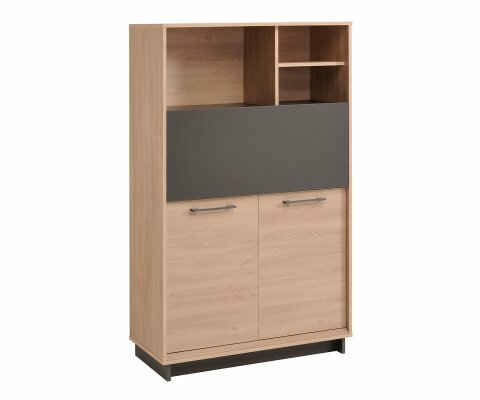 CLOSED 2-DOOR CABINET: Two large cupboards open to reveal a central shelf, giving lots of space for storing your daily dishes or heirloom china…or your wine and liquor bottles! OPEN DIVIDED SHELVES: Cubby-style open shelves provide space for home décor, glasses, books, and more! 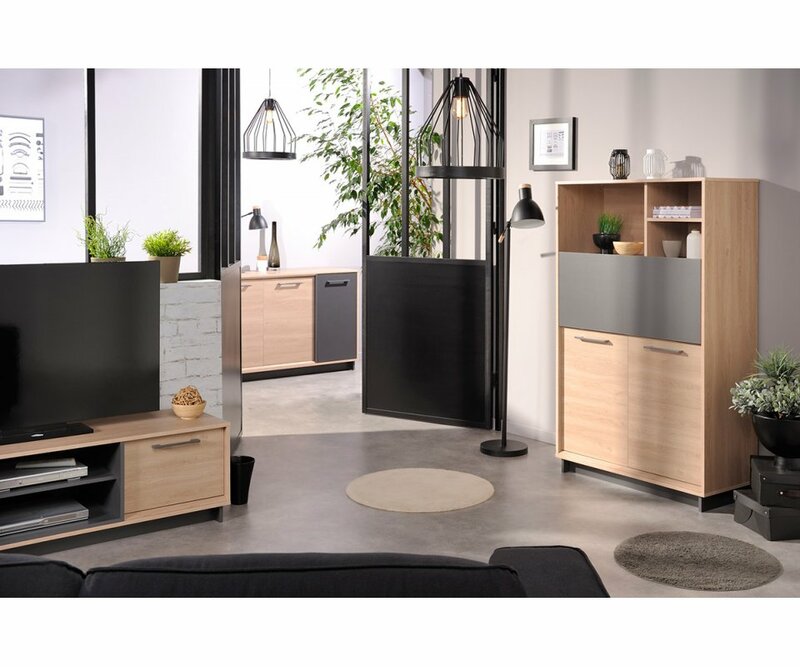 This versatile dishes cabinet by Parisot of France can hold your everyday dishes, your best china and wine glasses, or can be used as a free-standing liquor bar for entertaining family and friends! 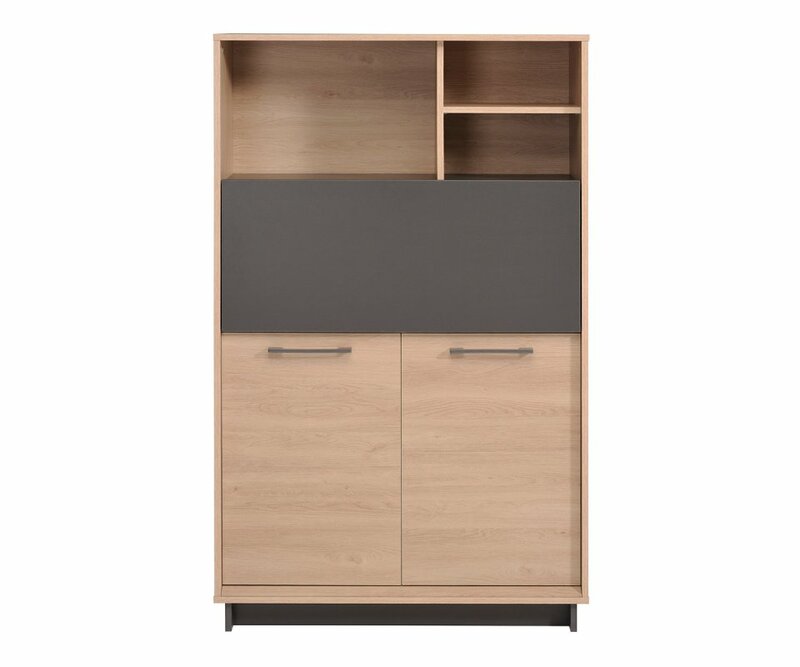 The cabinet frame is finished in natural Brooklyn Oak veneer, accented with solid Dark Gray veneer. Open shelves with dividers provide a place for glasses and home décor, and a two-door cupboard below has roomy shelves for lots of dishes or your entire liquor and wine collection! 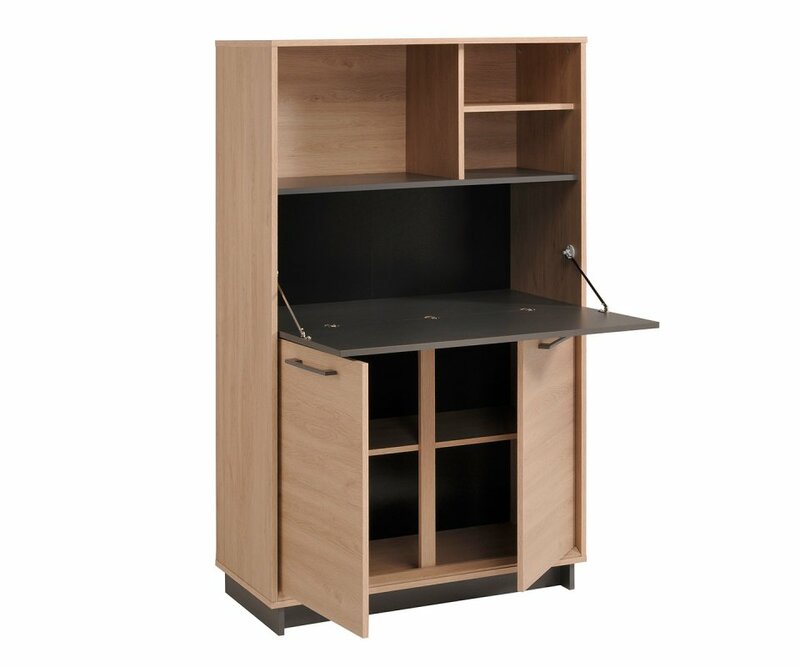 The fun feature is the gray fold-down panel that hides whatever is kept behind it when closed, then opens to become a counter for serving or to use as a desk for a laptop or creating delicious food! 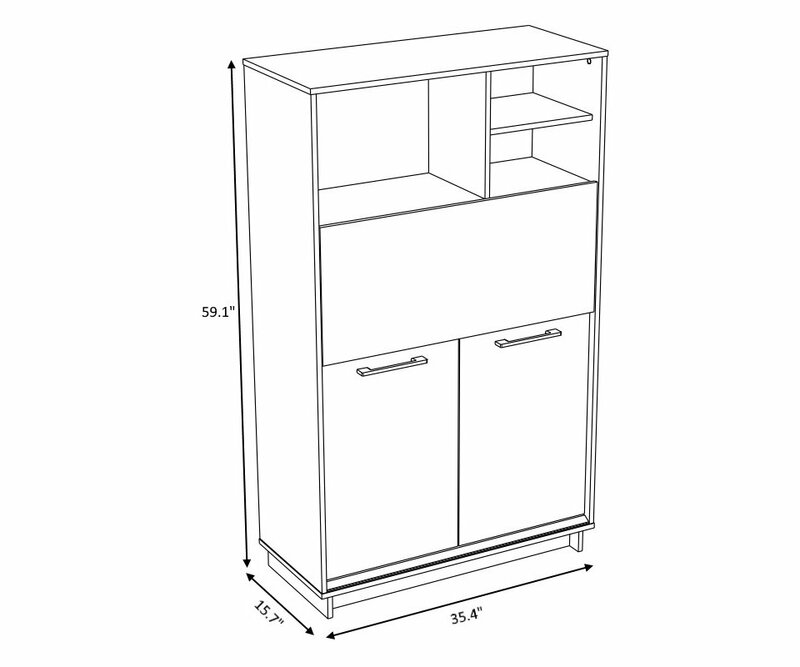 You will love the contemporary style, durability, and versatility of the Feel Dishes Cabinet! 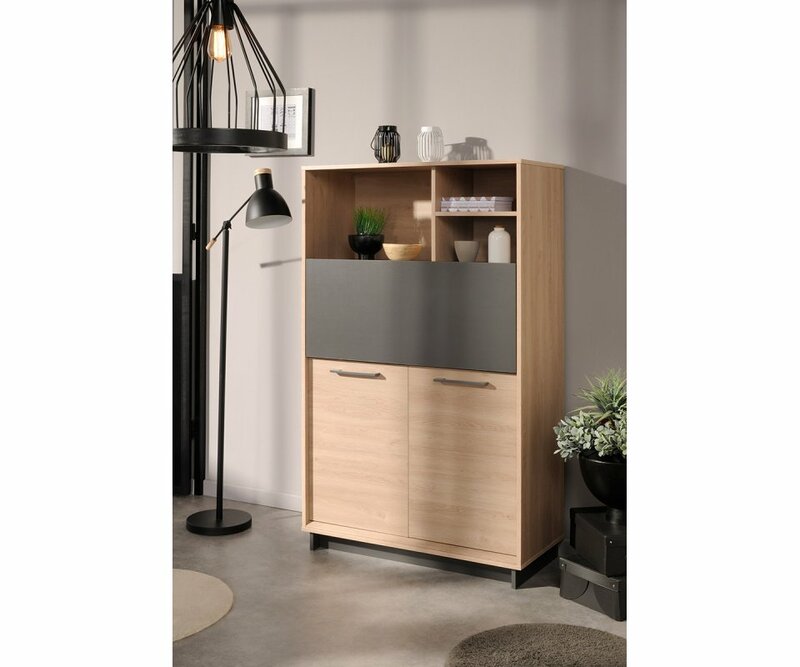 SIMPLY ELEGANT DESIGN: Simple, sophisticated lines and neutral colors are the contemporary features that allow this sideboard to coordinate with most home décor styles and color schemes.TWO-TONE COLOR: Light, natural Brooklyn Oak woodgrain and contrasting Dark Gray veneer are used in a unique way, .. CONTEMPORARY STYLE: This TV table has modern lines, neutral color palette, and provides organized storage for today’s modern television and media equipment.STONE & WOOD VENEERS: The natural look of Brooklyn Oak woodgrain and Dark Gray stone veneers provides a neutral combination that coordinate..
ECLECTIC STYLE: Simple lines and neutral color palette create a table that works with many home décor styles and color schemes.2-TONE COLOR: Light Brooklyn Oak woodgrain combines with Dark Gray solid paneled sides under the table top, creating a dramatic silhouette for the focal point of your dinin.. ELEGANT ECLECTIC STYLE: The natural 2-tone color palette and simple lines of this sideboard allow it to coordinate with many homes, from traditional to modern in design!2-TONE VENEER FINISH: Light, natural Brooklyn Oak woodgrain and Dark Gray solid veneers combine to create a wood and stone appeara..